The Drop-In Centre run by Mind Aberystwyth is open to the local community and offers a space for people with mental health issues to get advice. It also supports a number of volunteers. 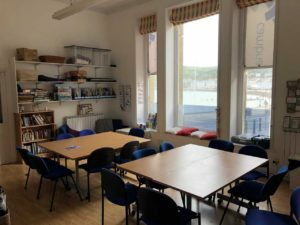 Mind Aberystwyth believes that the new Drop- In centre can provide vital services to the local community in and around Aberystwyth, especially to those who like information about Mental Health or need help and advice. Our Drop-in Service runs on a Wednesday from 1:30 to 4pm.